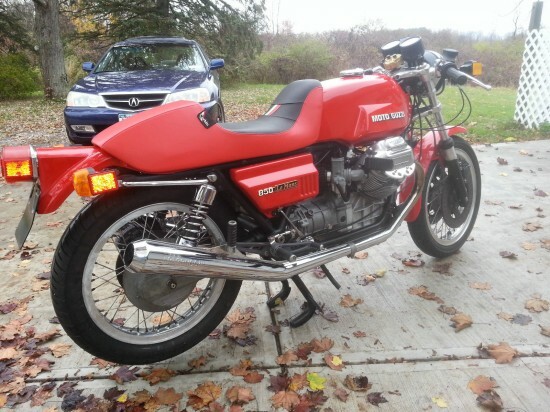 Well, here’s another Moto Guzzi T3 someone’s converted into a V7/LeMans clone. 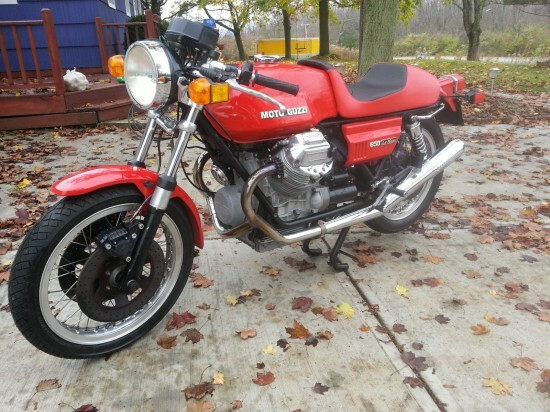 For the uninitiated: Guzzi’s famous v-twin started out powering a very strange Italian military tractor and that durable, slightly clunky durability translated strangely well into its new role as a sporty motorcycle powerplant. And stuffed into a lower, lighter frame, it made a pretty good motivator for a few genuine sportbikes as well. 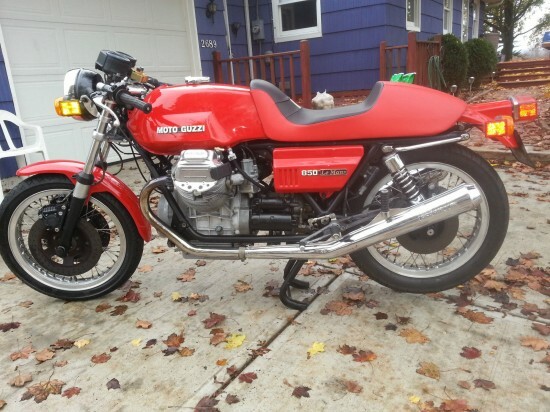 As I’ve stated and restated ad nauseam, Guzzi’s vanilla-looking and relatively common 850T used the same basic engine and Lino Tonti-designed frame as the very sporting and practical V7 Sport and LeMans. All of the stuff to create one of these is available online, from V7 and LeMans pattern tanks and side panels, clip on bars, rearsets, and exhausts. And there are plenty of engine builders who can build you a fire-breathing Guzzi motor that will make that bum-stop saddle earn its keep. 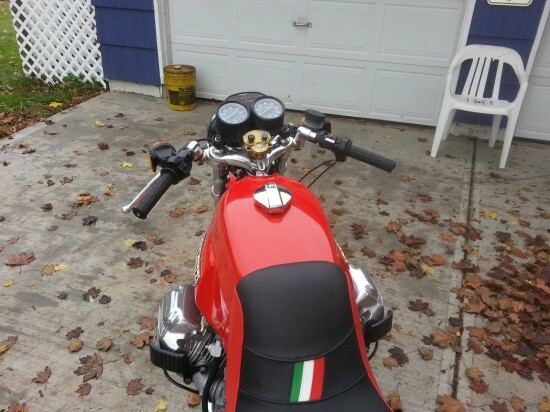 This one is also done pretty nicely and features an upswept LaFranconi exhaust system that should give a bit more cornering-clearance than the classic “shark gill” mufflers from the V7, and the wire wheels are a great look. There may be little too much red on this bike, though: I think maybe that rear-fender/taillight assembly could be easily be blacked-out or revised/removed. 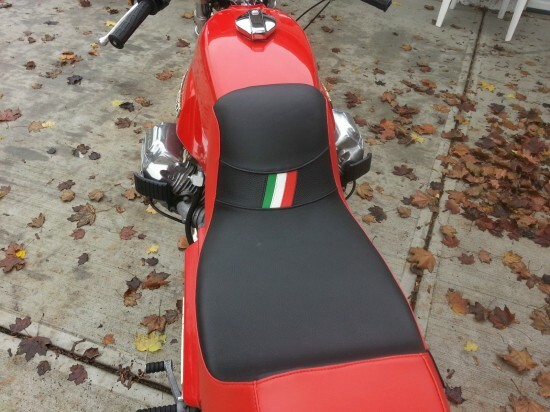 And the large red panels on the seat are not my taste. Black maybe with red stitching might be better and would be something easily fixed by the buyer, as mentioned in the listing. And those reflectors, while aiding safety, are also pretty clunky-looking. I think I’d probably add some mirrors and remove the reflectors creating a sort of “net safety wash…” Aside from the [probably very comfortable] Corbin seat and the aforementioned bits, I really like this bike. Not much time left on this one, and with a starting bid of $5,900 it seems appropriately priced. Someone jump on it quick! You posted this same bike in November. Ugliest seat ever. Its an abomination. Hey! Thanks for the heads up. 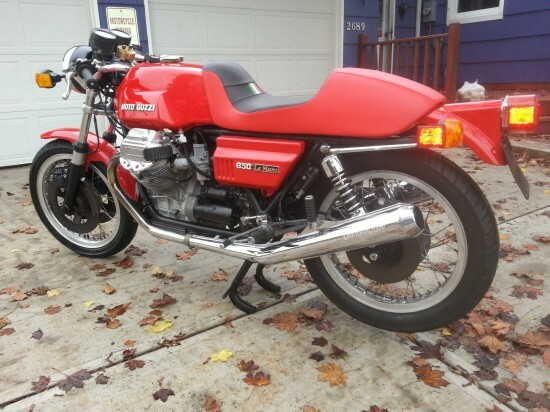 I think it’s a nice bike, just a bit too red and the price is a bit high for a “Mock I”. Hopefully it will find a buyer this time.